Spanish Prime Minister Pedro Sánchez warned Tuesday he will call an early general election unless parliament approves his minority government’s draft 2019 Budget, which is being blocked by Catalan separatist parties. Sánchez, who took over in June from the conservative Mariano Rajoy after a surprise no-confidence vote, has up until now vowed to stay in office until 2020 when the next general election is due. But his Socialist (PSOE) party controls just 84 seats in the 350-seat parliament, the smallest proportion for a government since the country returned to democracy following dictator Francisco Franco’s death in 1975. For his draft budget to win approval, Sánchez needs the support of the parties that brought him to power in June, including Catalan separatists. They have so far steadfastly refused to back the spending plan, which includes a rise in the minimum wage. ‘If we are not able to approve the budget, my desire to arrive to the end of the current legislature will be put in question. I will call elections when I feel they are in the general interest of the country,’ the prime minister told a Madrid business conference. The rise in the minimum wage would be ‘an important identity marker for a Socialist government like his’ so failure to approve the budget would be a major setback for the government, Paloma Roman, a politics professor at Madrid’s Complutense University, told AFP. Catalan separatist parties, which have lawmakers in the national parliament, are angry that prosecutors have called for pro-independence leaders to be jailed for up to 25 years over last year’s failed secession bid in the wealthy northeastern region. They therefore refuse to cooperate with Sánchez on the budget. If the government fails to win approval for the budget, it could roll over this year’s spending plan which was drawn up by the previous conservative government and try to pass some its announced measures by decree. But conservative opposition parties have strongly criticised this option. Sanchez’s government has also struggled to move ahead with its plans to move Franco’s remains from a vast mausoleum near Madrid to a more discreet location. Separately, an agreement with the conservative People’s Party (PP) to nominate judges to the Supreme Court fell apart on Tuesday. ‘Every day, a new front opens, which rattles him and could push him to call elections’ which could allow him to win more seats in parliament, said Roman. 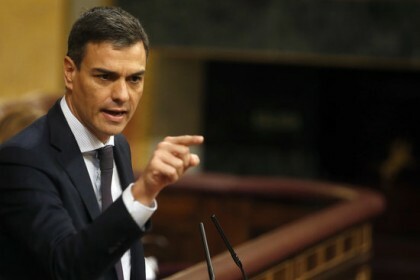 Sánchez’s own comments come a day after Transport Minister Jose Luis Abalos, a heavyweight in the Socialist party who is close to the prime minister, raised the possibility of calling snap polls to coincide with European, regional and municipal elections on 26 May. ‘Of course, we can’t rule out anything,’ Abalos said when asked about early elections in May. The Socialists are leading in the polls, with 31.6% support, more than 13 points ahead of the main opposition conservative People’s Party (PP), according to a closely-watched survey by state pollster CIS last month. Under Spanish law, Sánchez would have to do so by April 1 at the latest for the vote to be held on May 26. ‘There is a debate at the heart of the government between those who want to go to the polls and those who have more doubts,’ said Cristina Monge, a political scientist at the University of Zaragoza. Sánchez is among those who are more reluctant to go to the polls, since he would want to have more to show for his time in office, she added. She predicts the government will instead wait until the autumn of 2019 to go to the polls.